After making love you would quickly say good-bye. I’m in love with you still. all the promises you couldn’t keep. in love with you still. if I’m in love with you still? for all those nights you beat me black and blue. You raped me and you stole my pride. or even worse- you’d commit suicide. So I’m loving you still. All the pregnancies you made me kill. Lied by saying they weren’t in God’s will. so you would love me still. How can one man behave so violently? And what’s my problem? I’ve got a Law Degree! But I’m loving you still. How can one man be so very cruel? I can’t just turn and walk away. Too many kids… too many bills to pay. is that I’m in love with you still. Where is the man who used to wine and dine? The one I was so proud to call all mine? We’ll get it right, we’ll gain it back in time. ‘Cause I’m loving you still. Things aren’t that bad, I’ve convinced myself. At least you’re not leaving me for someone else. Your buddies say I might as well be dead. things will improve once we are wed.
You didn’t mean to give me that black eye. You didn’t mean it ’cause I saw you cry. You were drunk- that was your alibi. You know I’m gonna love you still. What ever happened to my self-esteem? I’ve grown accustomed to this sick routine. You’re the most pitiful man I’ve ever seen. But I’m in love with you still. If you can identify with this woman in any way, it’s not too late to get help! 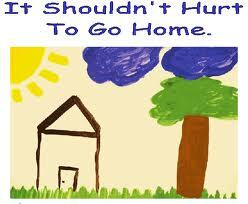 Contact the National Domestic Violence Hotline at 1 (800) 799-SAFE (7233) or log onto http://www.thehotline.org. Advocates are available 24/7. Anonymous and confidential. This entry was posted in RANDOMly Me, RESPECTFULly Yours and tagged Abuse, Domestic Violence, Self-Destruction by The Practical Chick. Bookmark the permalink.